Have you ever felt like a fraud at work? You’re not alone. While many high-achieving women and entrepreneurs share this feeling, it is common for everyone. Over an estimated 70% of people have experienced this and similar feelings at one time or another. In corporate America it’s easy to feel like you’re not competent enough. Over time, this chronic selfdoubt or Imposter Syndrome can impact your productivity and prospects. 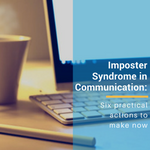 Imposter Syndrome is a collection of feelings of inadequacy that persist even with opposite information. It's experienced internally, and can be hard to identify from an outside perspective.